The East End lays claim to two of London’s most famous pubs. 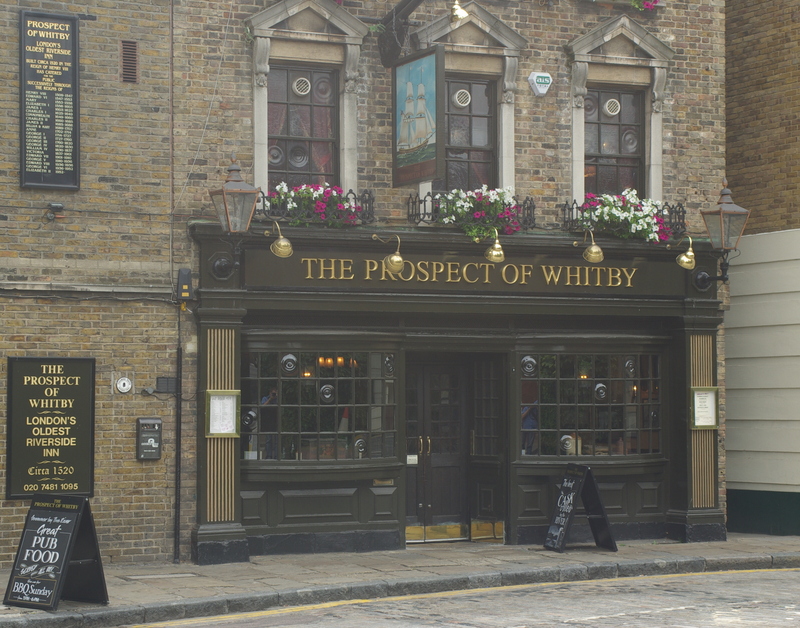 While the Queen Vic exists only in fiction, the Prospect of Whitby is a real riverside treat, apparently the oldest of its kind in England (early 16th Century). My Thirst Mate and I went along for lunch on a Tuesday afternoon and explored the building carefully before settling at a table on the terrace. The building oozes history, although only the stone floor is original. 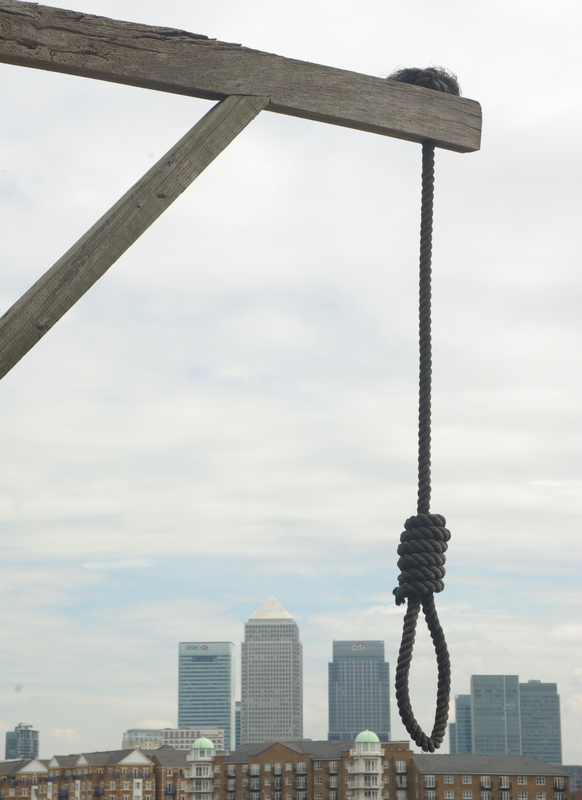 There are plenty of pictures of a bygone era and eerily a hangman’s noose dangles over the river in memory of an early patron, “Hanging” Judge Jeffreys, who enjoyed a beer while watching executions just a little way upstream. We ordered a beer and a shandy along with our food at the bar. The shandy turned out to be a straight beer, but this was rectified without fuss. There is a great choice of food: lots of typical pub meals including baked potatoes with a range of fillings and sandwiches. My Thirst Mate opted for pork and black pepper sausages and mash and I ordered a stilton and bacon burger with chips. The food was excellent with the exception of the chips which I found overdone, a little brown and crisp to taste. The mash was just the right consistency and the burger and sausages were rich and full of taste. We enjoyed our visit and would recommend it especially for a sunny summer afternoon on the terrace or a colder evening inside as the autumn approaches. Our meal came to £24.05 including drinks. The Prospect of Whitby is next to the river on the D3 bus route near Wapping station. 57 Wapping Wall, E1W 3SH. Telephone 7481 1095.